Saving money is one of the most common financial goals American consumers have on their to-do list. It is usually on top of their list together with getting enough exercise and eating right. However, there is a big chance that this goes on for a few months and then forgotten later on. It is quite difficult for a lot of people to remain consistent whenever taking on something new. But there is no denying the benefits it brings to your finances. Having the ability to save empowers you to make better financial decisions as you try to reach your long-term goals. Debt management is also a lot easier to attain when you are able to save money on the side. This helps you address your current and future needs at the same time. 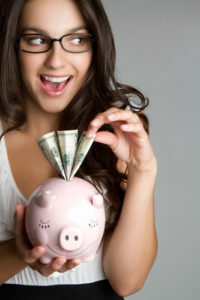 There will be a lot of tips you will see online when you plan to start saving money. But here are a few of the most practical tips you can start with. This is one of the first things you need to understand to help you in saving money for the future. There are a lot of people who seems to confuse this term and goes on to buy themselves thing they want. There is nothing wrong with giving yourself a reward for a job well done. It can even inspire you to do a better job the next time around. However, paying yourself first means something else. Forbes.com stressed this in a recent article pointing out that it does not entail spending on yourself. It simply means that you save money first before attending to other financial obligations. You set aside a specific amount to save prior to paying bills or other items in your budget. The way around it is to think of this as a priority payment. Even before you pay anything else or use your money, attend to this at the very beginning. One thing you can do is to enroll it in an auto-debit program. It gets transferred to a specific account before you even have any ideas what to do with the money. As you go on and make improvements in your finances, it would come to a point where you would have more excess funds going around. You might get promoted at work, grow your business, or simply grow your savings account. At this point, it is really tempting to increase your lifestyle with all the extra funds you have. CNBC.com shared a story where a couple’s financial struggles highlighted a lifestyle where fashion was a critical turning point. It induced lifestyle inflation because styles change every few months. This leads to overhauling wardrobes a few times in a year. This might be extreme for some but it happens. Increase only when needed – a bigger family needs a bigger house and a second car. A promotion at work might require you to change your wardrobe. But if there is no need, it is better to stick to your budget or even try to live below it. There are a lot of ways to approach a frugal living which might confuse a lot of people and make them lose interest. Some stories even highlight extreme cases where people dumpster dive just to look for things they can use and at times, eat. It is important to note that these are considered radical approaches to the lifestyle and should not be looked at as an example. Frugal living simply means trying to live below your means. The funds that you do not get to use can help you in your goal of saving money for future use. Done consistently, it also turns into a habit that can help you reach your financial goals faster. The more you get to save, the faster you can pay down your house, save up for retirement or pay for your student loans. Frugality puts you in a great position to churn out your creativity as you address daily expenses. Your food budget can be trimmed down if you buy groceries in bulk and batch cook for the whole week. It helps you serve delicious and healthy meals and cuts that desire to order take out. Gallup.com explains that the average for the actual retirement age of Americans is at 62 years of age. There are some people who are able to retire before they hit 62 while others a little over that age. The goal with retirement savings is to make it as a priority and start early. That way, you develop the habit of saving money for it. You also get to enjoy the benefits of compound interest. Retirement is a far off place for those that are just starting with their first jobs and if you are one of them, just try to look back. College might have been far from your mind but you are now making payments on student loans. If only you could have saved early on right? Take that mindset and apply it to your retirement fund. Saving money now can help you address your needs in the future. As you endeavor in saving money for your the future, you need to have direction. It is not as simple as saving just to have money. It has to be for a specific purpose so you can put in more details into it. If it is for retirement then you have an amount you are aiming for. You get to work backward and break down that goal into smaller amounts. If you do not have a goal, it is very easy to just convince yourself you will do it tomorrow. When tomorrow comes, you might just as easily say you can start next month. As you are saving money, your goal will give you the direction and at times, the push you need. You get to quantitatively benchmark your efforts with your target allowing you the chance to track your progress. As you save money, you should not turn a blind eye on everything else. This is true, especially for your expenses. You might be gaining great headway with your savings goal but on the other side, you are racking up huge expenses. This will only negate all your hard work you put into saving money. All of those might only be used to pay off your debt. As you endeavor on saving money for future needs, you need to keep a close eye on your expenses. Be sure that you are not increasing your expenses simply because you have some funds stored in an account. You might also be tempted to increase your lifestyle because you know that you have extra money coming in every month. One of the best ways to address unexpected expenses is to strengthen your reserve funds. This consists of your emergency fund and rainy day fund that would help you cover most unforeseen financial emergencies. Saving money for the future should include allocations for your safety net of funds. It can help you manage potential problems as well as lower down your stress level. Saving money is a habit that will help you prepare for your future needs and is best started early and often. The more you practice it, the more it becomes second nature to you.